An XDI inner root, represented as a context node. Returns the inner root arc of a subject address and a predicate address. Factory method that creates an XDI inner root bound to a given context node. Factory method that creates an XDI inner root bound to a given relation. Return the relative inner graph of this XDI inner root. Returns the predicate address of this XDI inner root. Returns the predicate address of the inner root arc. Returns the underlying predicate relation of this XDI inner root. Returns the predicate relation of the XDI inner root context node. Returns the underlying subject context node of this XDI inner root. Returns the subject context node of the XDI inner root context node. Returns the subject address of this XDI inner root. Returns the subject address of the inner root arcc. Checks if a context node is a valid XDI inner root. Checks if a given arc is an inner root arc. True if the context node is a valid XDI inner root. contextNode - The context node that is an XDI inner root. 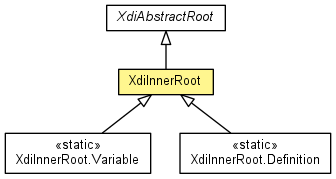 relation - The relation that points to an XDI inner root. The subject context node of this XDI inner root. The predicate relation of this XDI inner root. subject - A subject address. predicate - A subject address. The inner root arc of the subject address and the predicate address. contextNode - An XDI inner root context node. The subject context node of the inner root context node. The predicate relation of the inner root context node. arc - An inner root arc. The subject address of the inner root arc. The predicate address of the inner root arc. True, if the arc is an inner root arc.